Ensete ventricosum ‘Maurelii’ – A Big Red Banana Plant Revived Again! Red banana plants (Ensete ventricosum, also called Abyssinian banana) are herbaceous perennials from the Musaceae family hardy to zones 10 to 11. They can reach heights of 8 to 10 feet, perhaps even 12 in the best of situations, and take full sun with medium moisture. 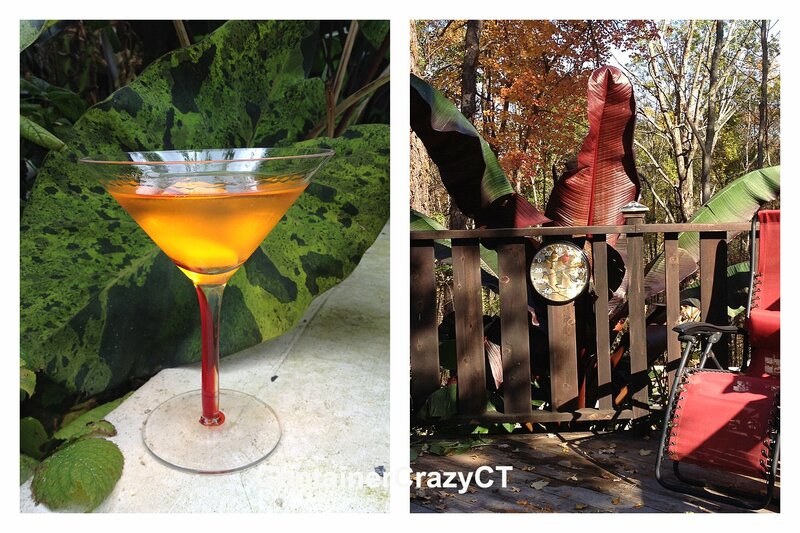 When sun and good moisture are provided, it will give you a show to remember, especially if you are not from the tropics, as most would not expect such a large tropical specimen to be growing in your Connecticut yard. But this is very doable if you store the plant appropriately over the winter, and follow the steps below to revive it to be planted again each year. For the third year now, I have taken my red banana plant (which is a cultivar, ‘Maurelii’) out of storage around this time of year to revive it and bring it back to life so I can enjoy it once more in my landscape or in a big container garden. Red banana plants love organic rich soils, so the large cement planter it grew in last year at my home during the summer is probably where it will return this season. 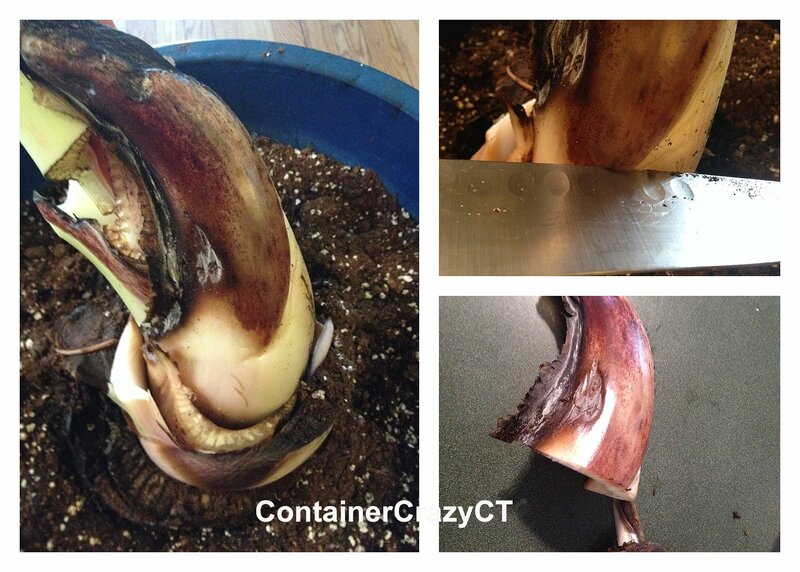 As I mentioned, in my blog post last fall about how to overwinter (store) a red banana plant, I took photos of the plant repeatedly last season. I also had people stand in front of it when I’d walk them around to my backyard for them to see my big red banana plant. Here’s a photo of my parents (on the left) and my Aunt and Uncle on the right from last summer. My mother is a twin, as you will notice. It’s so cute to see them get together and my Uncle joked with me about how I built a foundation for my plants – he was correct! They were having a fun day and it was a treat to have them stop by. Another time, when babysitting my nephew, I tortured him a bit by taking several photos of him in his stroller before we went for a walk. Here he is waving at me. Too cute! 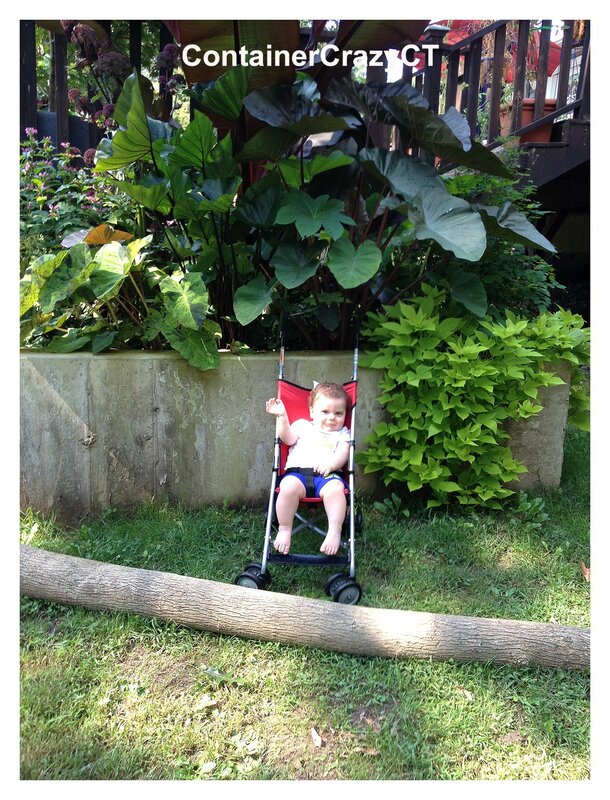 Someday he’ll look back at this photo and say his Aunt was nuts about plants. 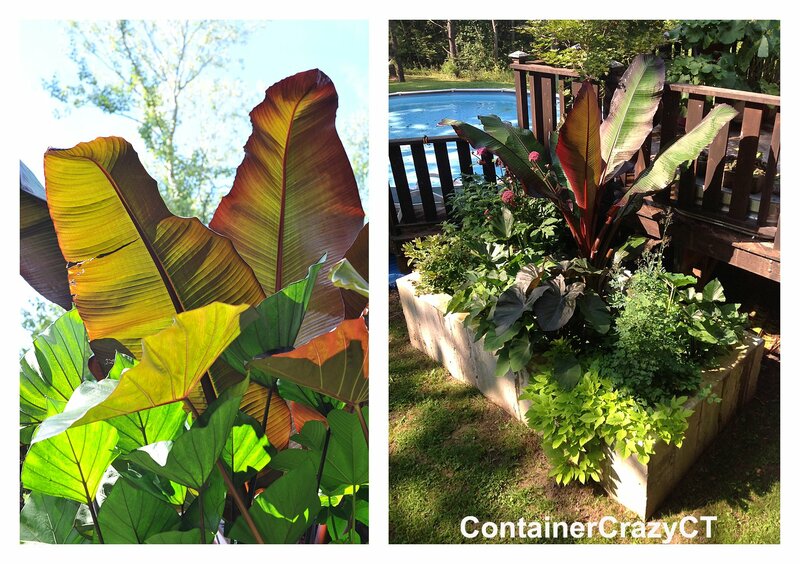 Red banana plants like some shade so the spot where this planter is located is perfect. It gets the morning sun on the east side, which my nephew is facing in this above photo, and later, it gets shade in the afternoon as the sun moves over head to the west. I also intentionally located it by our pool and below our deck, knowing the leaves would rise to the top of the deck railing where it could be seen as it grew to its towering heights. You can see I have many elephant ears and perennials planted around it. On hot days, as I watered plants on my deck, it was easy to have the hose over the top to give this planter regular drinks of water too. This plant likes good consistent moisture, and in my large cement planter this was never a problem because it is so large, it holds the moisture well. 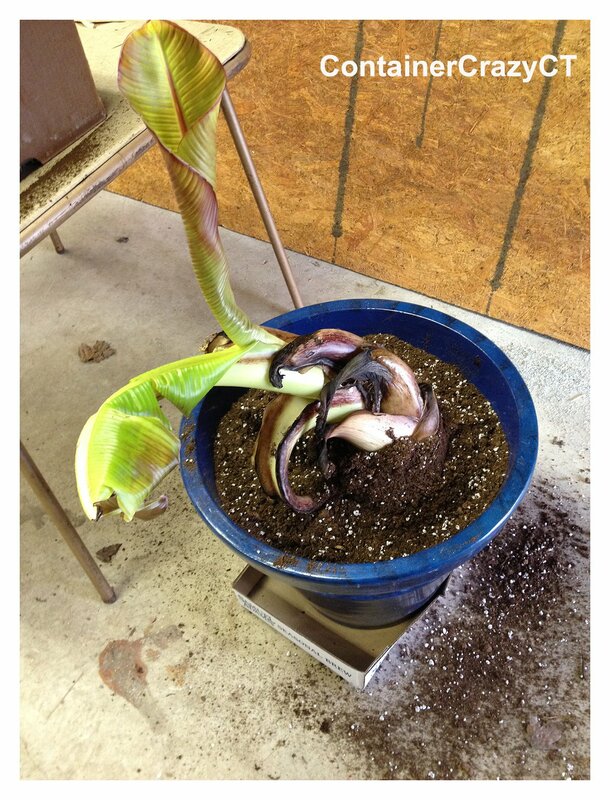 When you plant red banana plants into pots, I recommend you go as large as possible too. Okay – maybe not as large as my cement planter is possible for some folks, but remember the plant gets big, so you want a good sized pot, not only to give it a nice soil environment, but because a large pot will hold down a large plant well in the winds and will require less watering because it won’t dry out as fast as smaller pots. 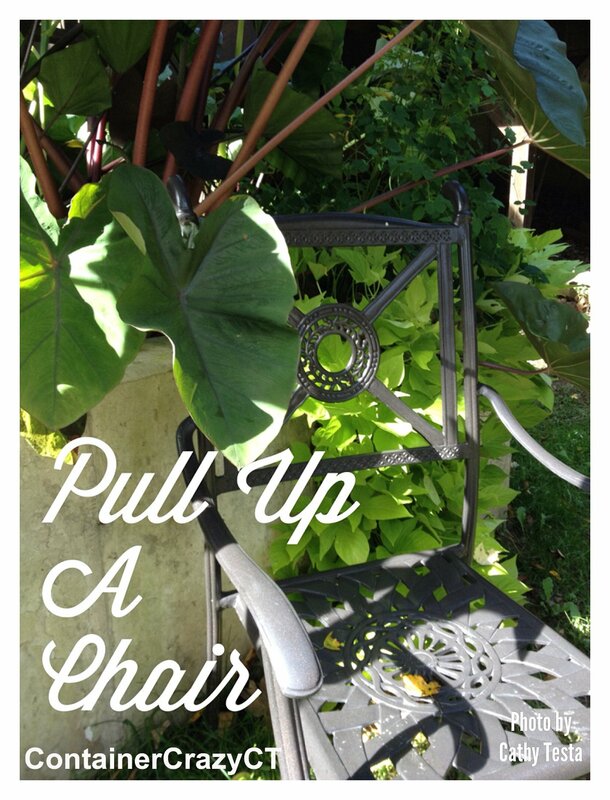 See my Cathy T “5 Must Do’s for Container Gardening” for more information about how to succeed with container gardening. Many people will ask if my red banana plant will get bananas, and the answer is no, probably not. Because I cut it down every season in the fall after it gets hit by a frost to store the root base, it may never produce a flower, but there are other types of dwarf banana plants you can grow that will get fruit, one being Dwarf Cavendish. In fact, I gave one of those to my sister in law one year and she kept it in her sun room all winter. The following summer, it produced a bloom and had tiny bananas which her family was afraid to eat because they never experienced that before. 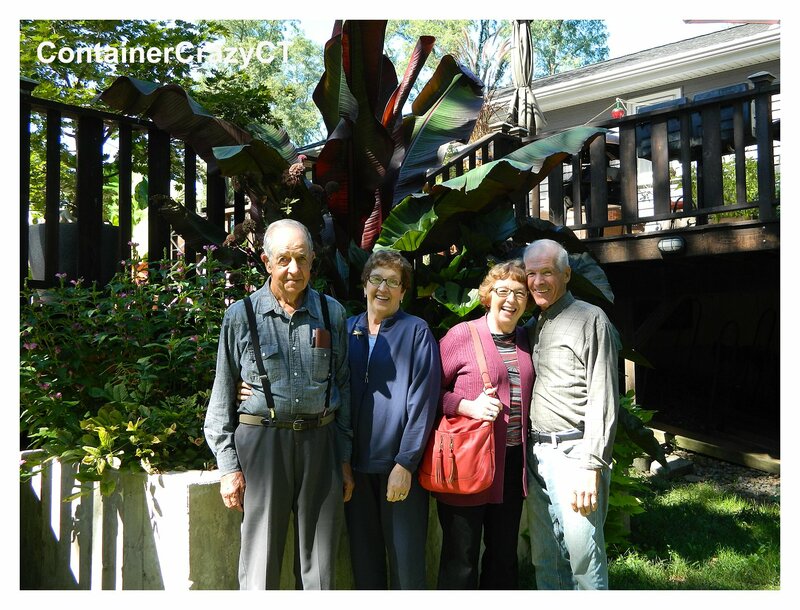 It was a new experience for them to see a tropical plant produce fruit in their home. At the end of the season, I took a photo from the other side of the deck. You can see how the leaves reached the railings. I also found the spot where it was placed to be a nice private place to sit and have a cocktail in the summer. But eventually it was time for it go to. 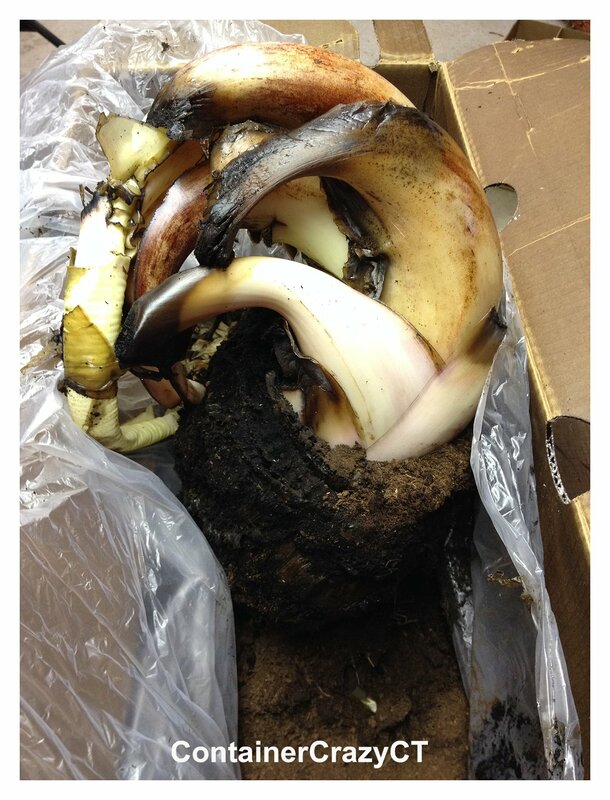 This is what the root base looked like after I took the plant down. 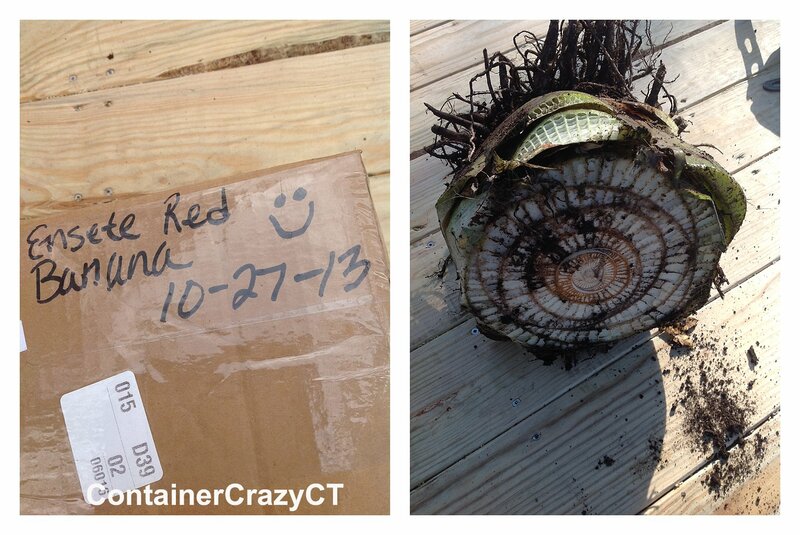 You can see the overwintering preparation steps on my blog post from the winter. Finally, spring has circled back around. So recently, I went down to my basement to check on the box. Sure enough, the plant sensed the temperatures changes, and I could see white growth from the top through the plastic taping I used to close the top. It may look like something out of a horror movie when you look at this image above of the plant as it is reawakening in the early spring, but believe me it won’t be long before it is returned to its beautiful state. My first step is always to check to see if it looks healthy, free of any little insects, and if starting to grow – which is was in the box. 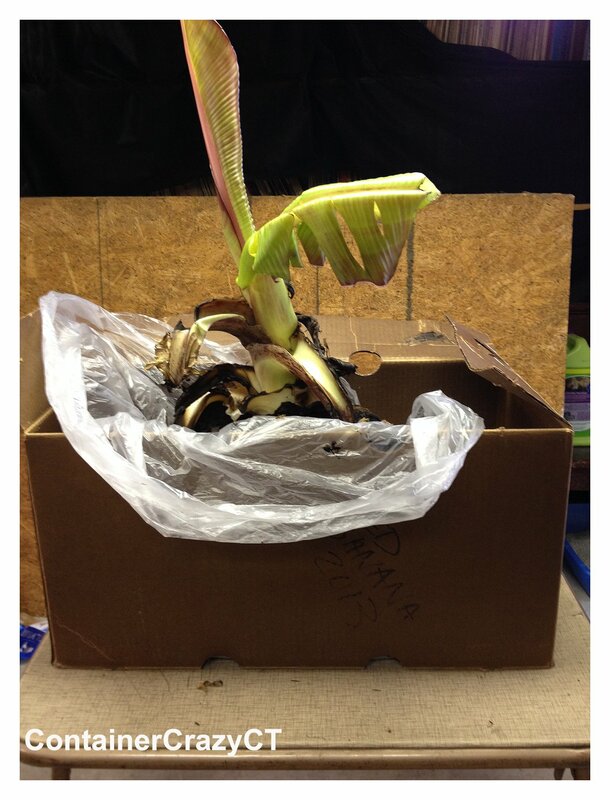 I opened up the box and positioned the root base to be standing upright. As you can see, the leaves began to rise. The bases of the leaves overlap like celery. And while it may look tattered, not to worry, it will perk up and look better in no time. I keep mine like this for a week or so and give it a tad bit of water, but not too much. I don’t want rot to set in now that I have it alive and revived again. On Wednesday, May 7th, of this week, I decided to pot it into a temporary pot using fresh quality potting mix specifically for container gardening. It happened to be a beautiful sunny day so my juices got going to get this baby into a better environment, and I watered it lightly again. The next day, I carried it upstairs to a room so it could get warmer conditions and some soft light. It will remain there until Memorial Day weekend when all chances of frost have past. And one other note, there were some outer sections which had some mold or fungus on it, where you can see the whitish area in these following photos. I took a sharp clean kitchen knife and sliced it off very carefully. If you do this, be careful to not cut the layer below the piece you are removing. This step was taken to reduce any chance of the fungus to spread. And any black parts were cut away also. It is hard to believe this once towering plant at 9 or so feet last year with 6 foot long leaves is now a stump that will regrow to the same size again in no time. It will sit in my spare room until ready to head outdoors, and as noted above, after all chances of the late spring frost has passed. I don’t risk putting this plant out too early after all the effort to store and reawaken it. And by the way, remember any plants you move outside to move into a shady location first so the leaves won’t burn when it is exposed to sun for the first time. Just like our skin, it can get hurt and you will see white damage on the leaves when exposed to sun too quickly. 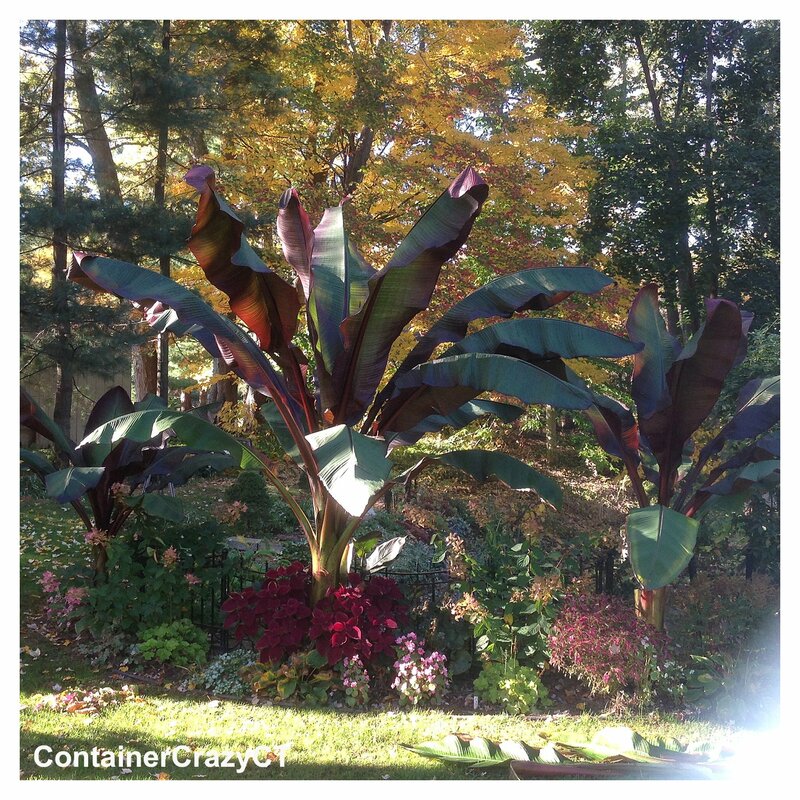 If you want to see what this red banana plant looks like in a landscape bed, check out this photo provided to me from a Master Gardener friend, Serena. She does garden maintenance, and was excited about her red banana plants last year too. We both were very happy to see the lush growth of our plantings. She lives in Connecticut also. By the way, Ensete ventricosum are referred to as “look-alike” banana plants because they are similar to the Musa genus but not part of the Musa genus. Does this really matter? Heck no! It’s a red banana plant to me! And it will go back outside in three weeks. P.S. A limited supply of these plants will be available at Cathy T’s upcoming class, the “Big Container Garden Party (Class)” on Saturday, May 24th. Happy Mother’s Day Weekend Everyone! Wonderful information and photos to go along with your article. I want a banana plant! I need you to come to my home and give me some of your great advice. I’m going to call you ! Looks like you are zone 7b – These do not over make it thru winters in that zone. I chop my down and store the root base – I show how to on my blog and offer a workshop but you are not near me. I will find the link for you and post it again! Cathy T.